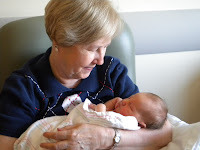 All it took was meeting her, holding her in our arms and our first granddaughter captured our hearts. She is not only a beautiful baby; she is a good baby, allowing herself to be passed from loving arms to loving arms without a cry or complaint. Addilee Ruth Long was born on August 6 at 10:15 on a beautiful Saturday morning. We almost made it in time for her birth, arriving at Presbyterian Hospital in Charlotte at 2 in the afternoon. We walked into the room and our daughter, Katie, asked if we would like to hold our granddaughter. As she placed Addilee in my arms, it was love at first sight; at first holding. Addie, as she will be called, snuggled into my arms, bonding quickly with her grandma. She was born on a day when the headlines screamed of historic economic decline in America. Enough doom and gloom to make us wonder what kind of world this precious child had entered and what kind of future she will have. But she was also born into a family with love for her and for each other; with parents to protect her and teach her and guide her. She comes into an extended family with a long history of strong spiritual roots and faith that will be a part of her upbringing and support. Addie was calm on the day of her birth, not troubled by the headlines. She seemed to feel the love that surrounded her. What will the future hold for Addilee? We can’t pretend to know. But I do know that her mother and father and her grandparents will always love her and protect her. No matter what the financial chaos of the world, she will be rich in the things that matter; the things that money can not buy.